When it’s time to renovate a bedroom, a first thought might be the colour of the walls. And after that? Well, maybe the curtains, the carpet or perhaps the bedspread. But you probably don’t think shabby chic paint and wax. That’s because your furniture is often overlooked as the transformation of your bedroom goes ahead. Until it’s all done. And then, of course, you realise that your 1980s or 1990s pine furniture doesn’t have quite the same feel as it once did. There is hope. With this particular job we were asked to renovate an old partner’s desk that had been cut up to form two bedside tables. Pine bedside tables. An excellent re-use of old furniture. 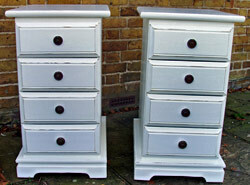 Our task was to bring these two bedside tables bang up to date with some shabby chic paint and wax treatment. The first stage of the shabby-chic process was removing the old varnish from the units using a power sander and then a hand sand for the fiddly bits. The picture shows that the top surface of one of the units has already been sanded. The next stage of the shabby chic process was applying a primer paint followed by an undercoat or two. We mainly use water-based acrylic paints for this stage of the shabby chic process. The exception is when we come across woods that leach through water-based paints. In those cases we use a shellac-based paint to mask the staining properties of the wood. We then followed up with several coats of Farrow and Ball Pointing estate eggshell paint on the two bedside tables before a very light shabby-chic sandpaper on the exposed edges. That’s a very popular choice which is why it’s on the shabby chic painting colour list for the year. 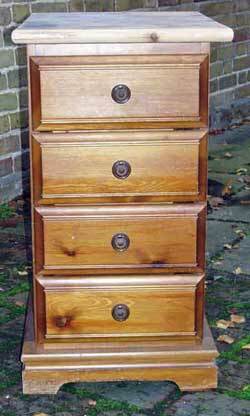 We can add any amount of “shabby” to a piece of furniture during the process. In this case we wanted a light “shabby” effect. Finally a coat or two of the neutral wax brought the new paint finish to life. Another positive shabby chic result. 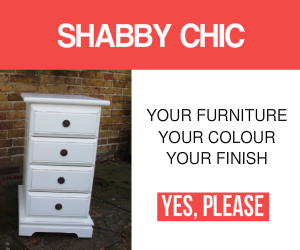 When you want to know more about how we can shabby chic your furniture, please don’t hesitate to get in touch.